"I love you more than anything, my sweet prince." We asked the BuzzFeed Community to show us their tattoos dedicated to their pets who have passed away. Here are the absoultely beautiful results. "I found Kittie outside 14 years ago. She was such a chill cat and just slept all day. My favorite thing about her, besides her soft fur, was that when she meowed, she sounded like a duck. I got this tattoo several months after she passed. I miss her and think about her every day." "I got this tattoo for all of my Wirehaired Dachshunds, both the ones alive and those deceased. Most of them are/were already senior dogs at the time of adoption and some of them had health issues. Despite that, they're still pups at heart and they loved running and playing in the grass." 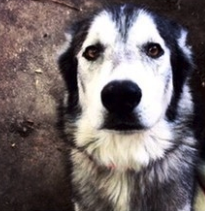 "We rescued Timber when I was in middle school. This first time we met, he climbed onto my lap and stayed there for the entire ride home. 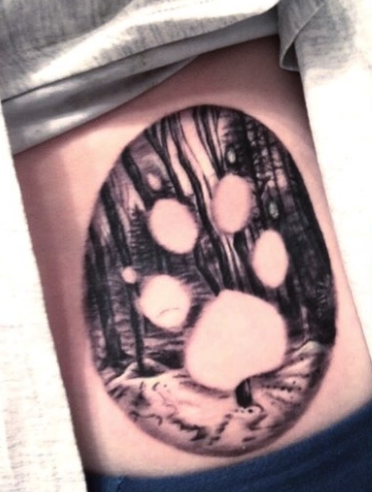 This is his paw print, and the space around it is a winter tree line because he loved playing in the snow. "My Pup was my best friend and sidekick for more than 11 years. He got lung cancer and left us all within the span of two weeks. Minutes before he passed, he nudged my arm and looked at me with his big eyes and, looking back, I know it was him saying, 'It's OK, I have to go now. I love you.' He was my anchor in so many stages of my life, so I had no choice but to get an anchor in his honor." "My Boston Terrier, Linus, in the Mirror of Erised from Harry Potter, which shows the deepest, most desperate desire of our heart. He'll always be missed." "For Bowie David, my bunny who passed. I couldn’t think of a more appropriate way to keep her, and her namesake, close to me." "We picked out a Batman-themed collar for Dexter when we got him and it ended up fitting his personality perfectly." 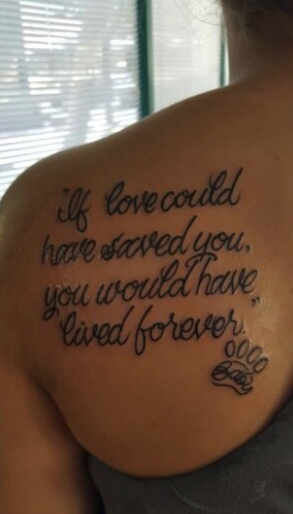 "My mom, brother and I all share this tattoo of our late pup, Trent’s, paw print. I had taken a picture of his print frozen on the driveway one day, and we used it to create this tattoo." "Every night, Fred the Cat would lie with his head on my bicep so I could give him scratches before bed. After he passed, I got this so the cat I loved growing up would continue sleeping by my side." "My BooBoo developed diabetes and pancreatitis and he stopped eating, so we couldn’t give him his medication. He was my baby and the whole experience was very traumatic, so I decided to get a tattoo of him." "I lost one of my dogs to cancer when she was 4 years old. Her name was Scout, named after one of my favorite literary characters, Jean Louise "Scout" Finch from To Kill a Mockingbird. I got an outline of the mockingbird from the original book cover to honor her. She was every bit like her literary namesake, and I miss her every day." "When I set up this tattoo appointment, I was only going to have my dog on it; however, two days before the tattoo appointment, my cat passed away. So of course I had to get them both. These guys were my very first pets and I miss those monsters every day." "When we adopted Lola, she had a rare heart condition. After open heart surgery, we'd hoped it would prolong her life, but she only lived to be about a year-and-a-half. We used to call her our little Thestral (the horses from Harry Potter that only people who’ve witnessed death can see). So, when she passed, I got a Thestral tattoo for her." "For my cat, Roxy. She passed away a few months after my grandmother, who loved cats as well. I couldn't think of a better way to celebrate them both." "For my baby Rudi, a Frenchie we adopted from a rescue group. His time with us was cut short by cancer, but his life’s impact is something that changed me forever. On the anniversary of his coming to our family, I got this reminder to show that he's gone, but never forgotten." "Every year, I took the same picture of Hampton with a bow tie. He passed away with no warning this February, and he was the best boy anybody could've asked for. I love you more than anything, my sweet prince." "I got this tattoo one year to the day after having to put my dog down. She was 15 and my childhood pet. Miss you, Molly." "I had my cat since October of 2004. After college, I moved out and was unable to take him with me. Two months after moving out, my dad called me to let me know he'd passed, sleeping in his favorite spot." "I had this piece done of my sweet Maggie Mae who passed away a few years ago. She was my first pet and my first tattoo. I'll always miss her, but I carry her around with me every day." "For my pet rat, Mr. Cloud. He was my soulmate and I miss him every day." "In memory of my baby girl, Ginger, who I had for 15 amazing years. The night before we had to put her down, I took the most detailed picture of her paw because I knew I wanted to have her with me all the time." "My cat saved my life. I was living with a combination of depression, PTSD, and anxiety and she came to me as a scared rescue with severe behavioral issues. I can't help but think we rescued each other. When she died, it lead me toward therapy and help. I can’t help but feel that even in death, she was there to save me one last time." "If you look at this tattoo, it looks like any paw print, but it's my cat's actual paw. He was my fur baby — he gave me kisses when I got home and he loved to sit on the counter beside me while I cooked." "For my little baby girl, Gretel. It’s been almost two years and I miss her so much. Whenever I go to my parents' house, I still expect her to greet me at the door, with her tail wagging like a maniac and her whole body shaking with excitement." "The late and great Teddy. He was my first dog and he was there for me when I was first diagnosed with depression. I'll never forget the wonderful years he spent with me and my family. Now he's with me forever." "A little over a year ago, my baby Butters passed away. The first pet that was 100 percent mine; the non-human love of my life. He was there for me through the really bad times and he always knew when I was upset. Not a single day has passed that I haven't thought of him." "After I lost my beloved Lab, I couldn’t leave the house for five days. The first day I could, I got this to remind me of her." "I got a semicolon with a paw print in remembrance of my emotional support cat, who passed on Christmas. I got it on my left wrist because that was the arm he’d always insist falling asleep on." "I'm obsessed with Futurama. When I got my cat, I didn't know what to name him, but I had a Nibbler pop figure in my car, so that's what I named him. This tattoo was incredibly painful, but it was worth it to have my best friend with me at all times." "When my dog Peanut died unexpectedly last year, I found a company that was able to mix his ashes in with the ink, so I got his teeth marks etched on my palm. He was the love of my life, and now I have a little piece of him with me wherever I go." "A few months after we lost my pup, I got her paw print in the color of her collar. It’s simple, but it means the world to me." "I've lost kitty babies before, but Midnight really hurt me because I personally had to make the decision to let her go. She had a very unique little speck in her right eye that I just adored." "Milagro was the beautiful horse I had for 10 years. He loved clovers and we would hack out in the fields all the time." "This is my dog's actual paw print lifted from a clay imprint I was given from the day he passed. His name was Samwise, like the hobbit, because he was loyal and kind. It’s been four years and my heart still aches like it was yesterday, but having this piece of him with me is a reminder of the friendship we once had." "For my two cats. Every time I lose one of my dear pets, I can add to it." "This is my daughter's tattoo of her betta fish, Lamar. She loved him so, so much." "My dog, Daisy, crossed the rainbow bridge a few months ago and I got a spur-of-the-moment daisy to remember her." "This is my baby, Noodles. I rescued him as a three-week-old kitten in a dumpster. 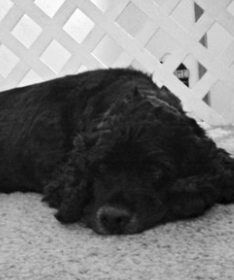 We had 13 short years together, and losing him was extremely painful. He was my ginger shadow and the best companion for a young girl growing into adulthood. I miss him every day." "Our family cat was my best friend for 15 years. This is my first and only tattoo and people say how much it reflects me as a person. It’s subtle and still quite big — I love everything about it." "When my house burned down, my dog and cat weren't able to make it out. My dog’s name was Oatmeal, so I decided to get some oats to commemorate him." 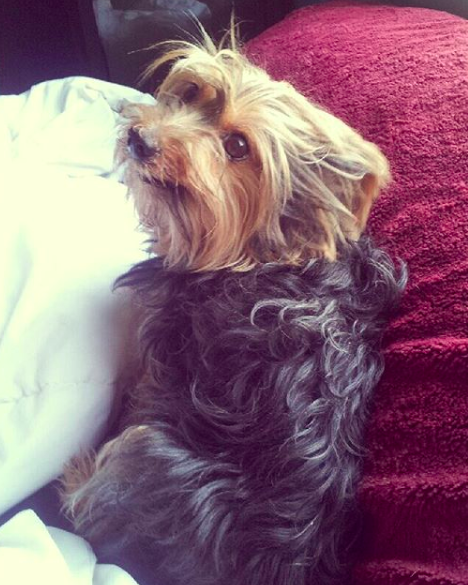 "I lost Zoey less than three months ago and I'm still so devastated. She was my best friend since I was 9 and we loved each other so much. I chose this design because she was my beating heart, and the dog in the middle has her funny ears. I loved those ears so damn much." "My kitty died this year from a heart condition. My heart hurts every day, but I see her on my wrist and I feel slightly better." "My baby was 11 when we rescued her. She passed one year after I graduated high school and I’ll forever be grateful for the years of happiness she gave me. She’ll always be my favorite friend." "Chase was two-and-a-half in October of 2016 when he was diagnosed with Stage 4 T-Cell Lymphoma. 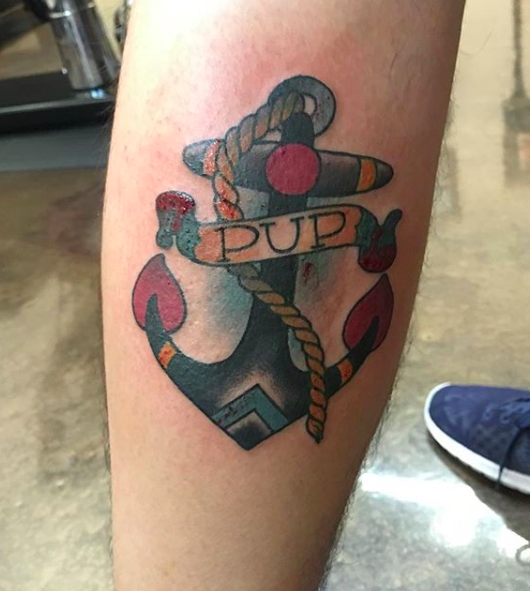 He passed away one week later, and I got this tattoo a week afterward. I think of him every time I look at it, which is a lot." "I used to kiss Conrad's paws every night before we went to sleep, so I got his paw tattooed on my forearm. Now I still get to kiss his foot before bed." "My cat Tiger only had one eye, this is his paw print." "I've had my dogs since I was 13. They were father and son, and they helped me so much while growing up. They'd always be excited to see me and their love helped me overcome bullying. They both passed away while I was living abroad, so I got this tattoo as a tribute to my best friends." 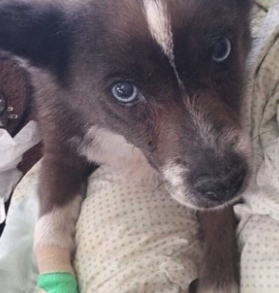 "My first dog passed away very suddenly while I was away on vacation. She was my first dog and she taught me about love. I felt like I needed a way to honor her memory and hold her close somehow. This is in honor of my Estrella, Spanish for Star. May she always look down on me." "I lost my girl to lymphoma when she was 6. Getting her portrait done brought me a lot of comfort." "My cat was my baby. When I was going through family problems, I knew I could cuddle him and everything would be okay. I had him for 16 years and this tattoo always makes me smile." "My best friend drew this for me a year or so before my dogs passed. Owen and Izzy saw me through a time in my life like no other, and they'll always be my babies." "His name was Ace and he was my best friend. He had a good 12 years on this earth, and I miss him every time I see a tennis ball. I thought I could commemorate him in a way that was less obvious than a paw print or a portrait."